 Vorty Net is a Bluetooth proximity reader that allows or denies a selected smartphone to unlock the electric strike of any door, or any electromagnetic lock, automated garage door, motorised gate or barrier. Digital keys can be activated through the cloud service, which can provide permanent access rights or for specified times and dates. Vorty also works with all existing access control systems through Wiegand compatibility, making it possible to upgrade existing cards systems. There are no restrictions on which smartphone brands it works with. It is not restricted to Bluetooth 4.0. Vorty apps are available for Android and will be for iOS devices. There's no need to issue cards, provide keys or remote controls anymore. Go keyless – your smartphone is your key! In most cases, you can install the system indoors, where it cannot be damaged from the outside. Administrator app with the ability to issue or revoke additional keys. The first registered user is given master key rights. Only a master can subsequently issue keys.